For fans of the Star Wars movie franchise, the date of May 4 each year has been adopted as the official holiday celebrating all things that we love about that galaxy Far, Far Away, and this year, as Star Wars Episode VII: The Force Awakens approaches, the celebration has come to the Outer Banks, with local members of the Carolina Garrison of the famed Star Wars cosplay group The 501st Legion in attendance to help raise money for charity. The Star Wars Day fun took place today, May the 4th, at Walmart in Kitty Hawk, featuring a bake sale, food, face painting. light saber building, and photographs with special guests from The 501st Legion, with all proceeds to benefit the Children’s Miracle Network. A few the local members of The 501st Legion Carolina Garrison also gathered atop the very Tattoine-esque Jockey’s Ridge in Nags Head yesterday for photoshoot with Roy Edlund (aka the OBX Beach Bum), organized by Outer Banks stormtrooper Jason Hill, so of course OBX Entertainment had to investigate this disturbance in the Force. We were not alone, as some brave young Jedi also climbed the great sand to question these troopers about their mission. 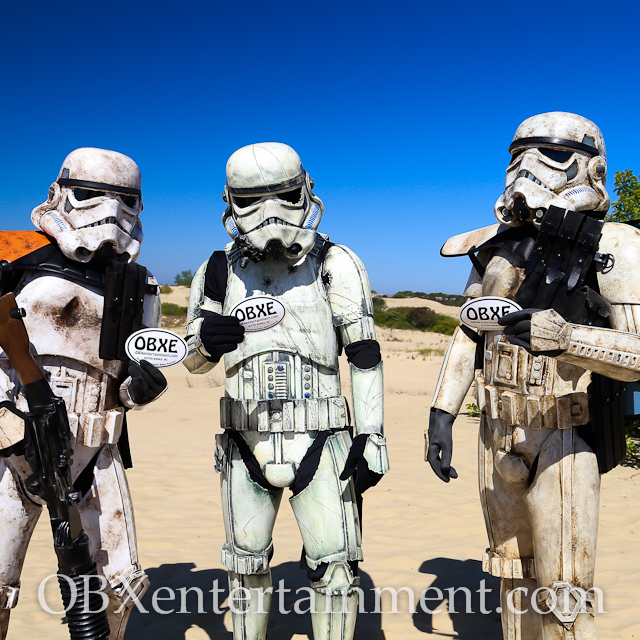 Watch our exclusive behind the scenes video in the player below, and then scroll down to view our photo gallery from the day the Empire invaded the Outer Banks and today’s event in Kitty Hawk!